ear after year Labor Day hits and you think, “Where did the summer go?” With endless trips to the beach, outdoor grilling and fun with family and friends you may have thought summer is here to stay! Let’s take advantage of these last few weeks of great weather with a festive Labor Day barbecue. Easy to prepare proteins like beef and fish as well as veggies work great on the grill – they’re easy, fast and delicious. But don’t think that fish is your only healthy option; lean protein, such as lean beef and poultry, provide essential nutrients to fuel activity and also help people consume more essential nutrients in fewer calories, while balancing their food intake with physical activity. Don’t forget you can marinate to maximize flavor and tenderness. Tender cuts of beef can marinate for 15 minutes to two hours for flavor. 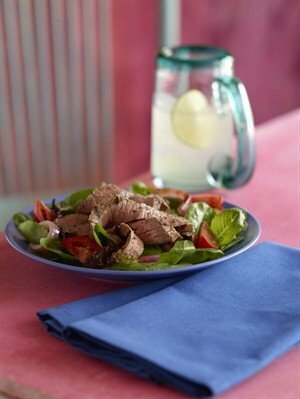 Less tender cuts, such as Flank, should be marinated for 6 hours, but not more than 24 hours. The steak of your choice atop a bed of arugula get a flavor boost from balsamic and Parmesan. Brush onion slices with 1 tablespoon vinaigrette; set aside. Press chile powder onto beef steak. Place steak in center of grid over medium, ash-covered coals; arrange onions around steak. Grill steak, covered, 11 to 15 minutes (over medium heat on prepared gas grill, 13 to 16 minutes) for medium rate to medium doneness, turning occasionally. Grill onions 13 to 15 minutes or until tender, turning occasionally. Separate onion slices into rings. Carve steak into slices. Season beef and onions with salt and pepper, as desired. Toss salad greens with remaining 1/3 cup vinaigrette and divide among 4 salad plates. Top with tomatoes, onions and beef. Nutrition information per serving: 266 calories; 8 g fat (2 g saturated fat; 2 g monounsaturated fat); 70 mg cholesterol; 381 mg sodium; 20 g carbohydrate; 6.5 g fiber; 30 g protein; 11.4 mg niacin; 0.7 mg vitamin B6; 1.5 mcg vitamin B12; 3.6 mg iron; 30.8 mcg selenium; 5.2 mg zinc; 110.7 mg choline.